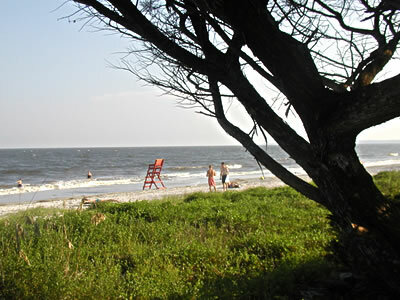 St. Simons Guide - The Official Website of Saint Simons Island and the Golden Isles. St. Simons Accommodations, Restaurants, Events, Entertainment, Golf and more! Welcome to St. Simons Island and the Golden Isles! In 2014, St. Simons Island was voted America's #1 Favorite Romantic Town as well as America's #1 Favorite Beach Town by Travel + Leisure Magazine. Through our partnership with Booking.com, we've made it easy and affordable for you to find and book a hotel room, vacation home, condo or rental property right here on our website, with the guaranteed best available rates and locations on St. Simons Island. We've compiled the best places to stay on St Simons Island, with everything from luxury resort hotels to inviting bed and breakfast inns, oceanfront condos, vacation rental homes, and more. St. Simons is also home to a variety of business and convention facilities, spas and wellness retreats, and campgrounds and RV parks for those seeking outdoor adventure! A few of our favorite hotels on St. Simons include The King and Prince Beach & Golf Resort, Village Inn & Pub, and for vacation rentals and condos we recommend Real Escapes Properties for the widest selection of rentals on St. Simons Island. We've partnered with Booking.com to provide you with quick and convenient online reservations at all the leading hotels and rental properties on St. Simons Island. Own a timeshare on St. Simons and looking to sell? Stop asking "How do I sell my timeshare" and find out what your timeshare is worth. St. Simons Island has glorious beaches that can stretch out for hundreds of yards at low tide. Coast Cottages is located at the largest part of the St. Simons beaches, just south of East Beach and the old Coast Guard Station. This is the finest beach on the island. Our high tide has ample beach for body surfing and our low tide expands the beach to couple of hundred yards wide. There's something for everyone to Explore on St. Simons Island - pristine, natural beaches and marshlands, abundant wildlife, historic sites and monuments, parks and outdoor recreation, world-class accommodations, fishing, watersports, boutique shopping and delectable dining. Yet you'll feel like you've stepped back in time to your own private beach town getaway, a hidden gem of a casual coastal paradise that has remained untouched by overzealous development and commercial activity. Surrounded on all sides by historic Southern Oaks draped in Spanish Moss that have survived for hundreds of years, expansive marshlands and waterways, sandbars, and the Atlantic ocean in the background, St. Simons Island will capture your heart and imagination like nowhere else on Earth. What are you waiting for - start Exploring! The best way to get up close and personal with the natural beauty and wildlife habitats that make St. Simons such a wonderful place. And of course there are trolley tours, ghost tours, dolphin tours, canoeing, kayaking and much more to do on St. Simons Island! The outdoors were made for Exploring and St. Simons is a nature-lover's paradise. One of the best ways to see St. Simons and the Golden Isles is by bicycle, whether maintaining a leisurely pace through the resort areas near the south end of St. Simons or pushing oneself faster along open roads at the north end. Bike paths wind around the airport, through the Pier Village and along the marsh at East Beach as well as the entire length of Frederica Road. The wide, flat beaches of St. Simons are perfect for bicycle riding and bicycle rentals, purchases or equipment are available at a number of locations on the beach and around the island. 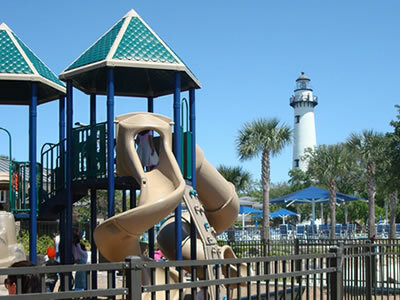 Located on Beachview Drive in St. Simons' Pier Village district, Neptune Park is an oceanfront public park that families flock to each night during warm weather months. Neptune Park features picnic tables under stately oak trees, a children's playground, a miniature golf course, swimming pool, lots of benches for relaxing by the sea, a fishing pier, and a bandstand where events are held throughout the year. Call 912.265.0620 or visit the Neptune Park web page for more information. First constructed in 1807 by James Gould on Couper's Point, this towering, 104 foot lighthouse was reconstructed in 1872 on the same site to replace the original which was destroyed by retreating Confederate forces in 1862. A beautifully restored 1872 lighthouse keeper's home complements the lighthouse. Located at 101 12th Street, near Neptune Park in the Pier Village. 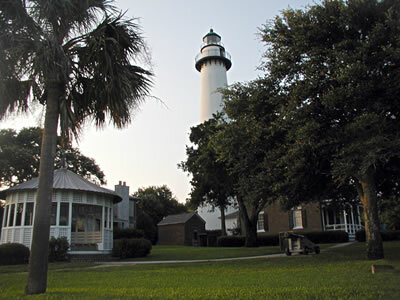 Call 912.638.4666 or visit the St. Simons Lighthouse Museum web page for more information and hours of operation. Located on the south end of the Island, this is a popular destination and the social hub of the Island, with plenty of restaurants, shops, and entertainment options. Here you'll find expansive views of the ocean around you, as well as the St. Simons Lighthouse and Museum, Neptune Park with its oceanside pool and facilities, miniature golf course, playground, and an oak shaded picnic area, public library and theatre. And of course the St. Simons Pier on the waterfront causeway overlooking Jekyll Island across the way and the port of Brunswick just around the way. The Pier is always bustling with activity, and you can cast a line or a crab trap here or just sit back and enjoy the show. You can now SAVE UP TO 65% and easily book your tee times at local St. Simons and Coastal Georgia golf courses right here on ExploreStSimonsIsland.com. 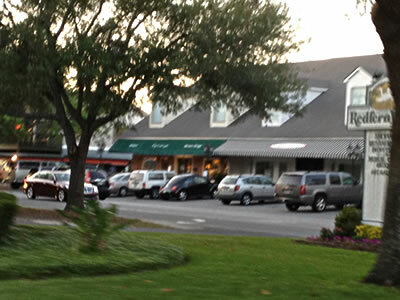 Featuring golf courses on St. Simons Island, Jekyll Island, Sea Island, Brunswick, Savannah, and coastal Georgia golf courses and country clubs. You can get your rod and bait at St. Simons Bait and Tackle near the St. Simons Pier and drop line at the pier or you can charter a boat for in shore or off shore fishing for Grouper, Snapper, Spanish Mackerel, Cobia, Redfish, Sea Bass, Whiting, Flounder, Tarpon, Shark and King Mackerel. We highly recommend Captain TJ Cheek with Coastal Georgia Charter Fishing or Captain Richie Lott with Georgia Sport Fishing Charters as the best fishing guides in the Golden Isles. On the beach, under the gold umbrella, just a three-minute walk from Atlantus, Barry’s Beach Service rents catamarans, sailboats, kayaks, boogie boards and windsurfing boards. Sailboat rides and lessons are also available. The best way to experience the Golden Isles and Georgia's beatiful coast is up close and on the water. Visit oceanmotion.biz for more information. Made famous by poet Sidney Lanier, these natural treasures are the first thing you'll see as you cross the marshes approaching St. Simons Island. The birthplace of much of our sea life, a kayak or canoe trip offers you the best way to experience the area's natural beauty. The Golden Isles takes its name from these marsh wetlands, which turn a wonderous golden hue during the colder months of the season. 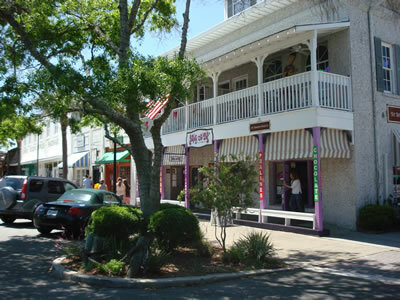 St. Simons Island, Brunswick, Georgia and the Golden Isles are located in the center of an area rich in natural beauty and history. Historic sites, monuments and artificats dating back hundreds of years are well preserved and easily accesible to visitors today, with a legendary story to be explored around every turn. 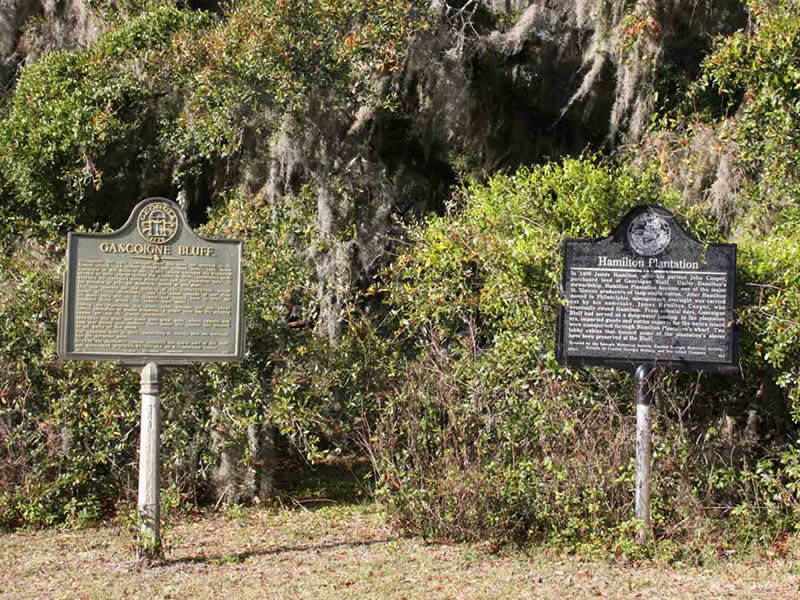 Built in the 1700s and 1800s, these island treasures provide an historical perspective of colonial and Civil War era Georgia. Take a trolley tour to learn more about the area's unique history and its American legacy. 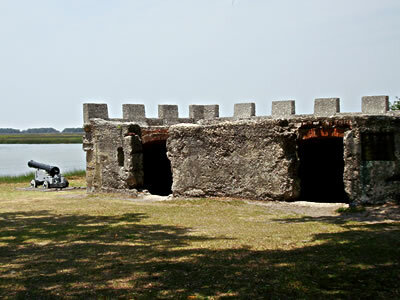 Check out our interactive online map of St Simons Island historical sites with information on local St. Simons Island historic sites and monuments, including the infamous St. Simons Island Lighthouse and Museum, Avenue of Oaks, Bloody Marsh Battle Site, Christ Church Frederica, the Maritime Center at the Historic Coast Guard Station on East Beach, First African Baptist Church, and Gascoigne Bluff. All recommended sites during your visit to the island. The Christ Church congregation traces its origins to 1776, and to the very earliest days of St. Simons Island. 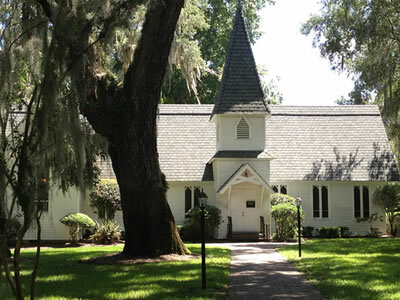 Today, the beautiful church with its magnificent stained glass windows and heavily wooded grounds that include a cemetery with graves of early settlers, is one of St. Simons Island's most treasured landmarks. 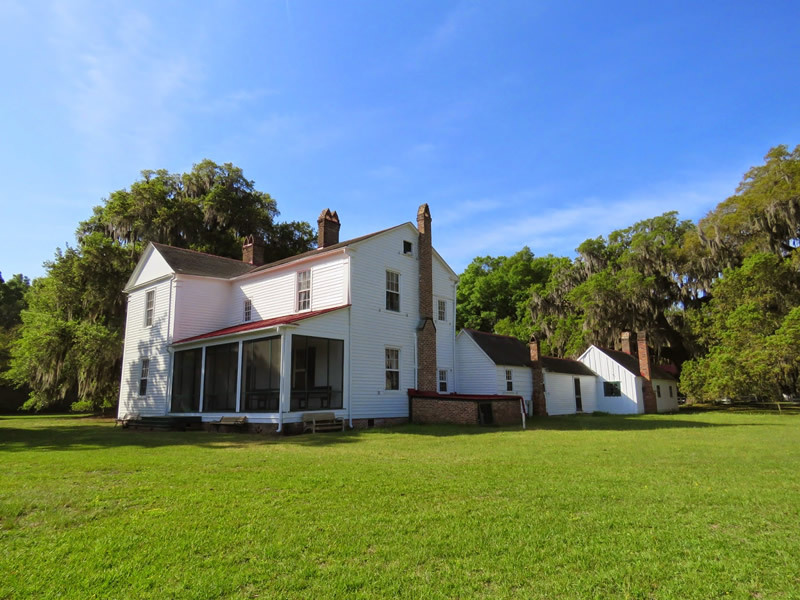 The Hofwyl Broadfield Plantation to the north of Brunswick, offers a glimpse into the lives of planters and slaves that grew rice along the Altamaha River nearly 200 years ago. You can tour the antebellum home built by the Troup family and examine the nineteenth century farm equipment still stored in the barn. Call 912.264.7333 for more information. 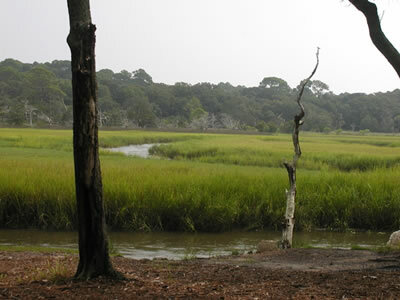 Located off Demere Road, the battle fought here on July 7, 1742, when Spanish troops landed on the south end of St. Simons Island, proved to be the turning point in the Spanish conquest of Georgia. The marsh ran red with Spanish blood and the battle was a decisive British victory which ended forever the threat of Spanish invasion into this important colony. 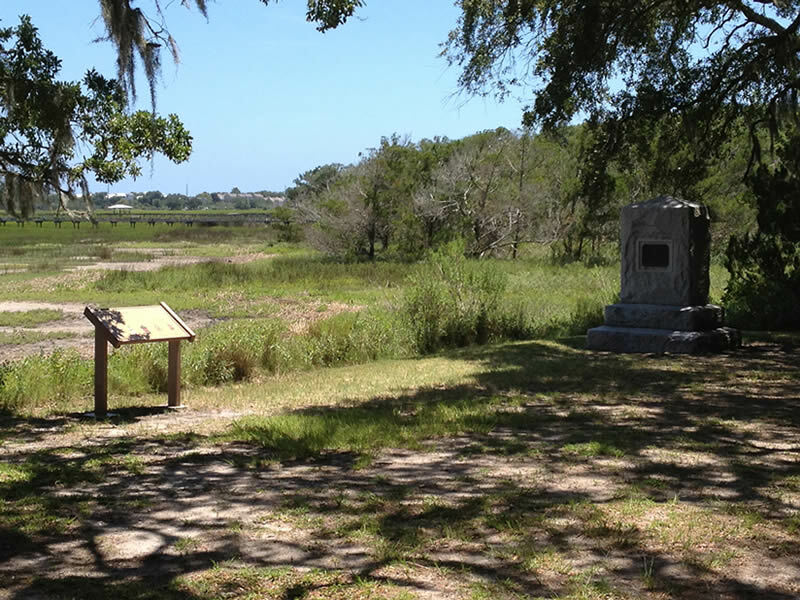 Overlooking the Frederica River, this former Native American campground became Georgia's first naval base during Colonial times. Named for Gascoigne, who first surveyed the Georgia coast for England. Live oak timbers milled here in 1794 were used in building "Old Ironsides," the USS Constitution, in 1874, and timbers were also cut here for the Brooklyn Bridge.